Once one, any or all of the assignments are complete, you, the instructor, may review the overall course performance. 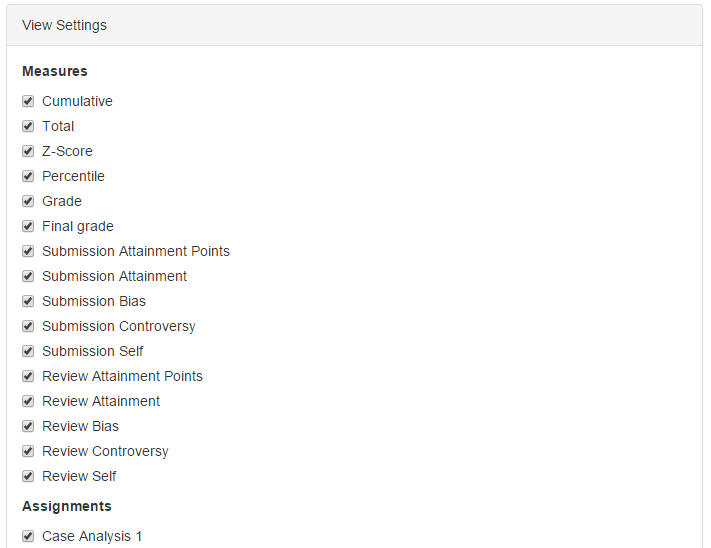 The Performance Report tab, accessible from the Course Homepage, is a grade book, very similar to your LMS. The report appears in a fashion similar to an Excel Spreadsheet. The default sort order is by Last Name. Any heading may be clicked to change the sort order. The Final Grade for an assignment may be changed here as well. Find the column containing the Final Grade for a particular assignment, double-click the cell and change to desired grade. The view settings determine what appears in the Performance Report. To turn an Analytic on or off, use the check box next to it. To choose whether and assignment appears or not, use the check box beside the assignment name. The entire performance report may be downloaded as an Excel file by clicking . The file will appear with all of the columns and assignments selected in view settings. It is important to note that the performance report will become activated, only after the first assignment is complete. This report is directly linked to the Learning Objectives set in the Assignment Settings. What is displayed here is the percentage to which the student successfully completed the learning objective, based on the Analytics. If a Learning Objective is based on Attainment in the Submission, then the Attainment received by the student directly affects their performance on the Learning Objective.